Researchers at the DogStudies lab at the Max Planck Institute for the Science of Human History have shown that dogs possess some "metacognitive" abilities—specifically, they are aware of when they do not have enough information to solve a problem and will actively seek more information, similarly to primates. To investigate this, the researchers created a test in which dogs had to find a reward—a toy or food—behind one of two fences. They found that the dogs looked for additional information significantly more often when they had not seen where the reward was hidden. In the field of comparative psychology, researchers study animals in order to learn about the evolution of various traits and what this can tell us about ourselves. At the DogStudies lab at the Max Planck Institute for the Science of Human History, project leader Juliane Bräuer studies dogs to make these comparisons. In a recent study published in the journal Learning & Behavior, Bräuer and colleague Julia Belger, now of the Max Planck Institute for Human Cognitive and Brain Sciences, explore whether dogs have metacognitive abilities—sometimes described as the ability to "know what one knows—and in particular whether they are aware of what information they have learned and whether they need more information. 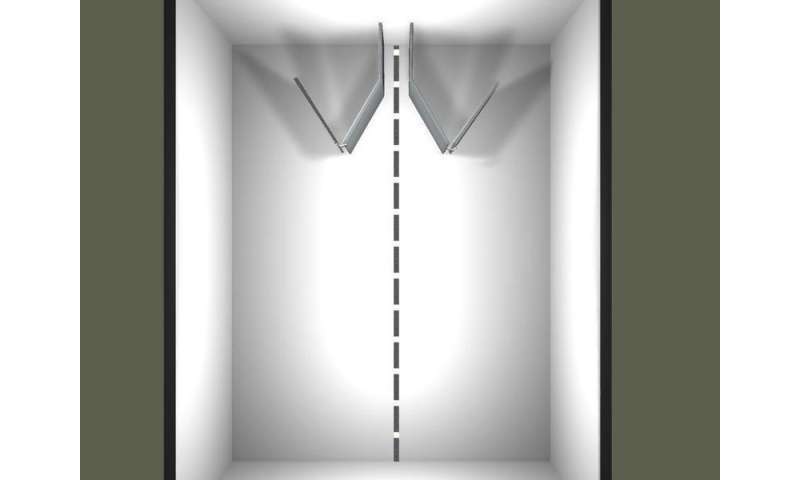 To test this, the researchers designed an apparatus involving two V-shaped fences. A reward, either food or a toy, would be placed by one researcher behind one of the two fences while another researcher held the dog. In some cases, the dog could see where the reward was placed, while in others the dog could not. The researchers then analyzed how frequently the dogs looked through a gap in the fence before choosing an option. The question was whether, like chimps and humans, the dog would "check" through the gap when he or she had not seen where the reward was placed. 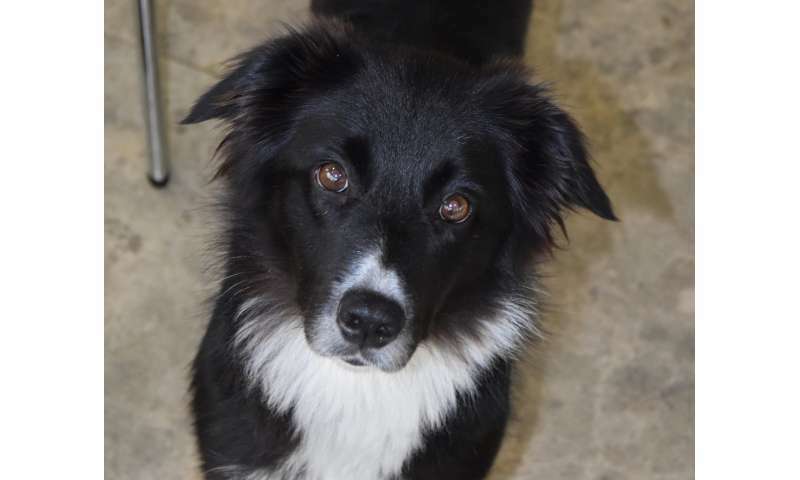 This would indicate that the dog was aware that he or she did not know where the reward was—a metacognitive ability—and would try to get more information before choosing a fence. 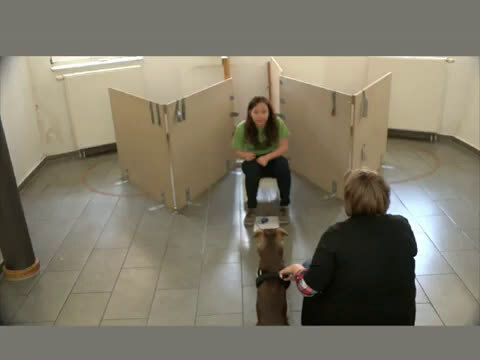 A video of a dog was participating in the third variation of the test, with a time delay. Credit: DogStudies. Belger & Bräuer, 2018. Metacognition in dogs: Do dogs know they could be wrong? Learning & Behavior. DOI: 10.3758/s13420-018-0367-5. Some researchers argue that some animals, such as dogs, may only look for extra information when searching as a routinized, instinctual behavior, and not as a result of a metacognitive process. To control for this, Bräuer and Belger tested whether dogs show the so-called "passport effect," originally described by researcher Joseph Call. When humans are looking for something very important, for example, a passport, they will engage in more active searching and will check for it more often than if they are looking for something less important or generic. Great apes display this same behavior—they will search more for a high-value food. Thus, Bräuer and Belger varied whether the dogs were looking for high- or low-value food, in order to test whether dogs also had the searching flexibility displayed in the passport effect. In another variation, they tested whether it made a difference to the dog when they had to search for a toy or for food. 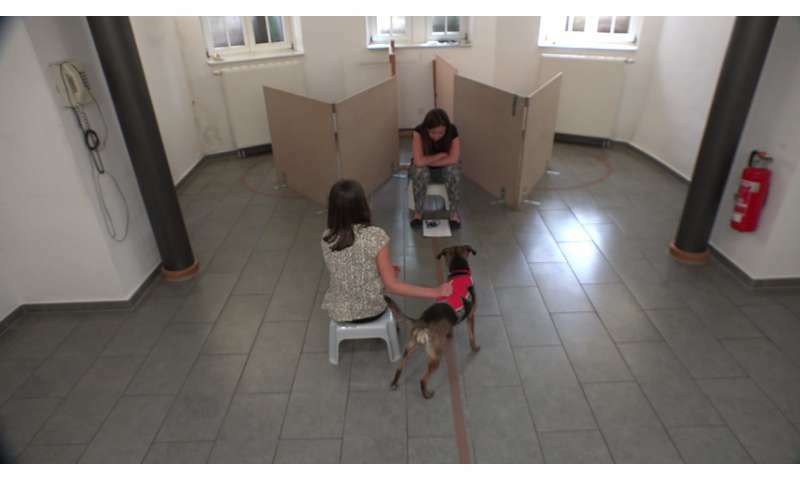 The overall set-up of the experiment, showing the two V-shaped fences, the experimenter who places the reward, the experimenter holding the dog, and the dog in starting position, without a curtain to block the view. This dog was participating in the third variation, with a time delay. Credit: DogStudies. Belger & Bräuer, 2018. Metacognition in dogs: Do dogs know they could be wrong? Learning & Behavior. DOI: 10.3758/s13420-018-0367-5. Checking, however, did not always make the dogs very much more successful. In the first variation, with food or a toy as a reward, when dogs checked they were correct more often than when they did not check. However, in the second variation, with high-value or low-value food as the reward, even when dogs checked, they were not correct more than one would expect based on chance. The researchers theorize that this could be due to inhibition problems—the dogs get so excited about finding the reward, that they cannot stop themselves from approaching the closest fence even when they have seen that the reward is probably not there. An illustration of the test set-up from above. Credit: © DogStudies. Belger & Bräuer, 2018. Metacognition in dogs: Do dogs know they could be wrong? Learning & Behavior. DOI: 10.3758/s13420-018-0367-5. The results did not allow the researchers to say definitively whether dogs possess metacognition, although they displayed some evidence for it. "For humans, vision is an important information gathering sense. In this case our experiment was based on a 'checking' action relying on sight—but the dogs probably also used their sense of smell when checking through the gap. We know that smell is very important for dogs and we could see that they were using it," states Bräuer. "In future, we would like to develop an experiment investigating under what circumstances dogs decide to use their sense of smell versus sight. This may give us additional insights into their information seeking abilities." If you don't think that dogs lie then you've never seen a beagle that has just stolen something from the garbage.